At Shop Fittings Manchester we supply over fifty different styles of male mannequins and female mannequins including posable realistic life size types. These are available to buy online in flesh tone, matt white, gloss white and gloss black. They can be purchased either with our without heads. 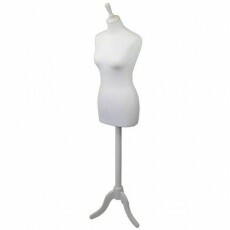 Our mannequins with heads are available with facial features or featureless. 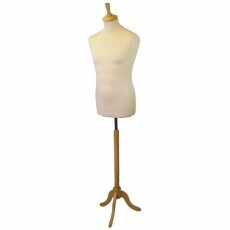 In addition to our standard range, we supply cheap, inexpensive mannequins that are constructed from durable polyethylene. 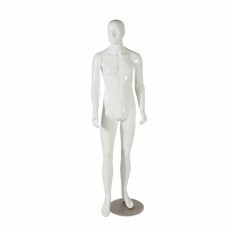 Display busts are clothing display products, modelled on a human torso. They can either be a full torso, or half torso, depending on the specific requirements. Display busts are often referred to in the shop fittings industry as 'bust forms', 'performance energy busts' and 'heavenly bodies'. 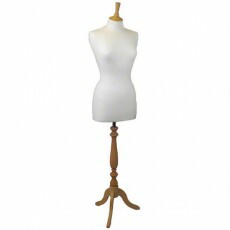 In many cases display busts are an ideal alternative to mannequins. At Shopfittings Manchester we specialise in the sale male display busts and female display busts with well-proportioned, durable plastic bodies, in ten different finishes. They are truly flexible display busts and give a stunning decorative performance for a vast array of garments, from swimwear to high fashion and art. Our display busts can be used in freestanding installations on a floor, pedestal, or shelf. We also supply display bust stands, including neck stands, back stands and leg stands. Tailors' dummies are a subject of much confusion. Strictly speaking, a tailors' dummy is an adjustable dressmaking aid, used by tailors and dressmakers. However, in shop display terms, a tailors' dummy is a traditional garment display product, based on the design of its dressmaking cousin. 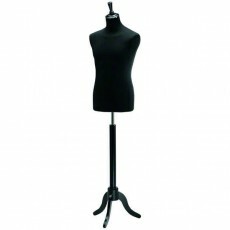 Typically, a tailors' dummy is a fabric covered, armless torso, mounted on a stand. Our huge range includes male tailors' dummies, female tailors' dummies and child tailors' dummies, in up to twenty different covers and six different base / neck cap combinations including more abstract forms. Our web site offers tailors' dummies as complete units, but we can also supply completely bespoke colour and style combinations, plus replacement covers. Please call us on 0161 834 8943 to discuss your specific manufacturer requirements. At Shopfittings Manchester we supply tailors' dummies to a wide range of customers, including major multiple retailers, fashion retailers, vintage clothing shops, bridal wear shops and domestic consumers. 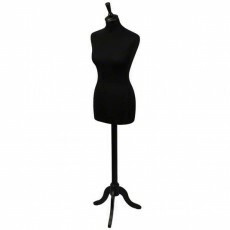 We also supply hundreds of tailors' dummies to colleges and students engaged in fashion design and cosmetology courses. Jewellery display busts are used for displaying a custom range of jewellery items. The necklace display busts, available from Shopfittings Manchester, are elegant miniature bust forms, styled on an upper chest and neck. We supply necklace display busts in three different colours: black, white and cream / dark wood, and in three different sizes. Our necklace display busts offer a cheap and competitive solution for displaying jewellery and accessories. Hanging body forms are a cheap and durable clothing display product. Effectively, a hanging body form is a lightweight, hollow torso front, suspended from a coat hanger type hook. Shopfittings Manchester supply polyethylene hanging body forms in four different colours: black, white, flesh tone and silver. Display heads are used for a wide range of designer fashion display applications, including hat display, glasses display and other material exhibits. Shopfittings Manchester supply competitively priced white polystyrene display heads in two different styles: Unisex display heads and male display heads. Creating first-class displays at little cost, buying mannequins couldn't be more straightforward.